PSA launches mobility venture Free2Move in U.S.
SEATTLE -- PSA Group officially returned to the U.S. at an event here, but it is not coming back as a traditional automaker. The automaker launched its mobility services platform, Free2Move, here Tuesday. The app connects car-sharing, ride-hailing, bike-sharing, public transit and other transportation services, allowing customers to plan short and medium-distance trips from one app. The company announced in April it was naming former TrueCar and Nissan exec Larry Dominique to lead the company's re-entry into the North American market. "I’m confident Free2Move will play a significant role in the way we all consume transportation in North America," Dominique said Tuesday. "The brand has already proved itself around the world as an equal to Peugeot, Citroen and Vauxhall." PSA introduced the app in September 2016 and now operates the platform in Germany, Italy, Austria, Sweden, the UK, Spain and France. But the U.S. will play a primary role in the app's success, said Brigitte Courtehoux, head of connected services and new mobility for PSA. “We want the U.S. to become the core of our mobility solution,” she said. Free2Move charges companies to host their services on the app. The platform appeals to transportation service providers as a way to access customers outside of their traditional user base, Dominique said. 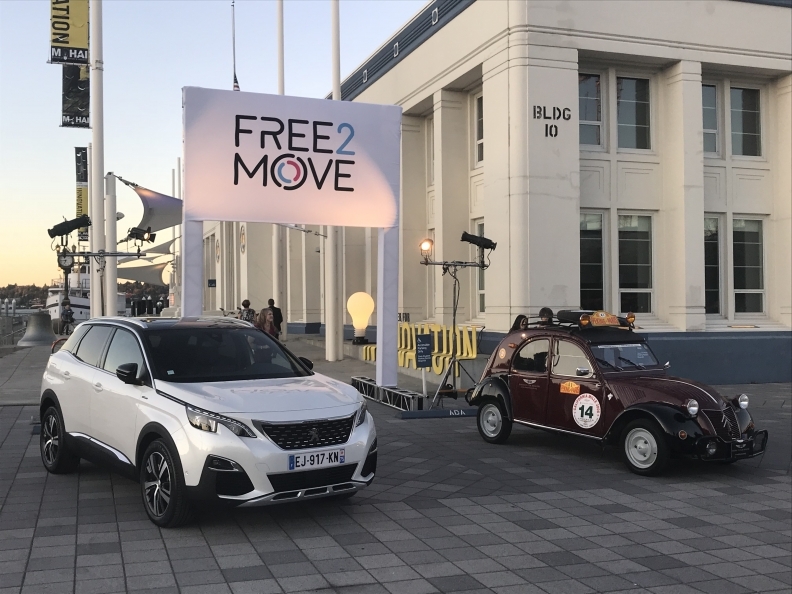 Free2Move is available in Seattle and Portland, Oregon, and the automaker plans to extend to other markets soon. Car-sharing providers Zipcar and Daimler's Car2Go currently operate on the app, and TravelCar, a peer-to-peer airport car-sharing service, will be on the app in two weeks. Bike-sharing services Spin, Ofo and Limebike will join in the next two to three weeks. PSA said it wants Free2Move to be the primary mobility services platform worldwide by 2030 -- a market that could be a potentially lucrative business alongside traditional car sales. Consultancy Frost & Sullivan estimates car-sharing services will grow 4.5 times in the next decade, and 36 million people will be using such services by 2025. An app such as Free2Move is appealing to consumers, said Mike Ramsey, a technology analyst at Gartner Research, by putting these burgeoning services in one place, and allowing customers to pay and book multiple forms of transportation through one platform. "They're using technology to connect under-used assets to under-met demand," Ramsey said. "The idea is very liberating and helps with the network problem." However, he added, other companies are also jumping into the space, including Daimler with its Moovel app.